The Cisco 350 Series switch can be configured using either a graphical interface orwith a command-line interface. To access other devices on the network from one central location, admins can take advantage of SNMP support. Additionally, your network can be secured using various advanced security features including SSL encryption, access control lists, 802.1X port security, advanced defense mechanisms, IPv6 support, uniform MAC addressed-based security, and storm control. ● Cisco Smart Network Application (SNA) is a network-level monitoring and management tool that can discover network topology, display link status, monitor events, apply configurations, and upgrade software images across multiple switches in the network. ● Cisco FindIT Network Manager and Probe are designed to manage Cisco 100 to 500 Series switches, routers, and wireless access points. The Manager lets you proactively manage the network instead of just reacting to events. ● Cisco FindIT utility, which works through a simple toolbar on the user's web browser, discovers Cisco devices in the network and displays basic information, such as serial numbers and IP addresses, to aid in configuration and deployment. ● One USB port on the front panel of the switch enables easy image and configuration transfer for faster deployment or upgrade. ● Graphical interfaces reduce the time required to deploy, troubleshoot, and manage the network and allow you to support sophisticated capabilities without increasing IT head count. ● Textview, a full Command-Line Interface (CLI) option, is supported. To assure that employees can always access the data and resources they need, the Cisco 350 Series supports dual images, allowing you to perform software upgrades without having to take the network offline or worry about the network going down during the upgrade. Advanced PoE capability simplifies advanced technology deployments such as IP telephony, wireless, and IP surveillance by allowing you to connect and power network endpoints over a single Ethernet cable. With no need to install separate power supplies for IP phones or wireless access points, you can take advantage of advanced communications technologies more quickly and at a lower cost. The switch supports 802.3af PoE, 802.3at PoE+, and 60 Watt PoE. Cisco uses NBASE-T technology to get more out of your existing infrastructure, so your network can meet consumer demands for increased bandwidth and speeds without a large initial investment. Utilizing your existing cabling infrastructure, Multigigabit Ethernet technology enables intermediate data rates of 2.5 and 5 Gbps to ease the jump between traditional rates of 1 Gbps and 10 Gbps. These intermediate rates run on most installed cables and preserve older UTP wiring, which is suitable for 802.11ac wireless LAN applications. The technology also supports Power over Ethernet (PoE) forms, including PoE+ and 60W PoE. Cisco Multigigabit Ethernet switches help you avoid having to run multiple cables between switches and access points and let your networks accommodate next-generation traffic speeds and data rates. ● Support for the Energy Efficient Ethernet (IEEE 802.3az) standard, which reduces energy consumption by monitoring the amount of traffic on an active link and putting the link into a sleep state during quiet periods. ● The latest application-specific integrated circuits (ASICs), which use low-power 65/40-nanometer technology and low-power, high-performance ARM CPUs. ● Automatic power shutoff on ports when a link is down. ● LEDs that can be turned off to save power. ● Embedded intelligence to adjust signal strength based on the length of the connecting cable. 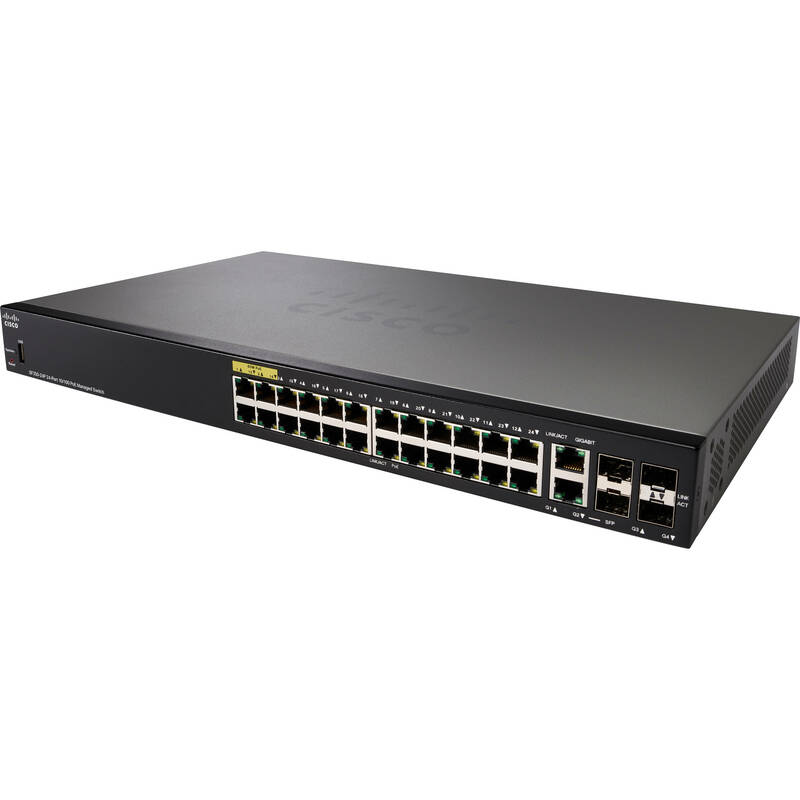 The Cisco 350 Series also offers mini gigabit interface converter (mini-GBIC) expansion slots that give you the option to add fiber-optic or Gigabit Ethernet uplink connectivity to the switch. With the ability to increase the connectivity range of the switches, you have more flexibility to design your network around your unique business environment and to easily connect switches on different floors or across the business. ● Complimentary software updates for bug fixes for the warranty term.